Hi Steve - do you know whether this would fit a 2910 STR? I’ve just got the similar tailpack but not tried to fit it and I think they’d look good together. Well, welcome to the Forum, (maybe a bit cheeky of me, because I am very new to this myself)! Anyway, What Bike do you have?, Have the racks arrived yet? Have you fitted them yet? Ok on all your info. Many thanks. Very interesting, to get a response to my post from you so far away! Have Fun at the show in Toronto. Our Daughter visited some years ago, (and walked around the outside of the Tower at the Top)! The Fixings are just loose Nuts and Bolts. They do not screw directly into threads in the rear Subframe. The Nut's are a special type called, Prevailing Torque. 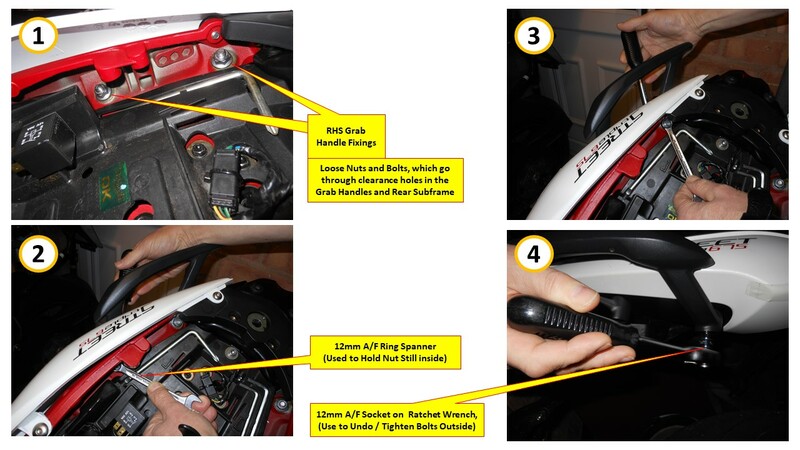 It just means that they have been designed so that they should resist the kind of vibration which tends to loosen ordinary fixings used on motorbikes, and not come loose. Because of that, they will be a little bit stiffer to undo, but not terribly so. I have shown you how I do it in some pics. If you are not keen, and decide to get some help to get it done, there's no issue there!, but the pics might help them too anyway. Hi Paige, just to make things interesting I’d throw in Hepco & Becker. Came across their c-bow mounts, might give more clearance. Sorry, another option and another maybe. Paige, I can only apologise, he did exactly this to me as well ! Opps. Sorry. But a person should know their options - only spotted them the other day.